The Lean Learning Center offers an innovative program this December to help organizations improve their results by focusing on transforming companies from the inside out. Do you have demanding customers? Are you facing a competitive market? Have you experienced recent growth due to acquisitions or mergers? Are you trying to establish one common way to improve? Does your company have a common, well established vision of what you are working to achieve? Is there a common goal? Are you unable to agree upon a single improvement method between your company’s divisions? Have you tried other improvement methods such as six sigma, 8D, TQM, PMI, IPM, Lamda, Triz and more, only to find that they don’t “fit”, or don’t spark cohesive improvement across the company? Do you have a desire and a necessity to be the leader in your industry? Is your company successful both internally and externally? Is your goal to remain at the top? If you Identify with just one of the above statements, then your company will benefit from the guidance and expertise offered through The Lean Experience®®. The only way to accomplish any of these goals is through the engagement of all employees throughout your organization who share the same vision for improvement and work collaboratively to achieve it. This program is designed to target employees in every level of your company, from the new intern to the top executive and provide them will the skills and knowledge necessary to hit the ground running upon their return to improve their work. The Airplane Simulation, in which teams complete to build aircraft that satisfies the unique requirements specified by the customer. The Beer Game Simulation, in which teams work in a supply chain to satisfy their customer’s demand. Each activity has been carefully designed to illustrate key concepts of the course and provide participants with an immediate opportunity to observe the impact of their use. Whom will I learn from? Will the teaching team understand the unique challenges that I face within my job and within my industry? Our instructional team is composed of respected business professionals with hands-on experience in a variety of industries ranging from automotive to aerospace to food, medical, military and service. Our teaching team represents 75 years of combined, proven experience in supply chain solutions, new product development, shop floor supervision and leadership, production planning, assessment to identify and address opportunity areas, and most importantly, implementing successful and sustainable change that produces results which will provide you with the examples and insights that you need to generate change. Is the Lean Experience ® right for you? Participants in the Lean Experience® program range from small companies to Fortune Global 500 corporations, from frontline employees to top executives. The instructional materials and methods were designed with this in mind and have been put to the test with over 5,000 participants with successful results. 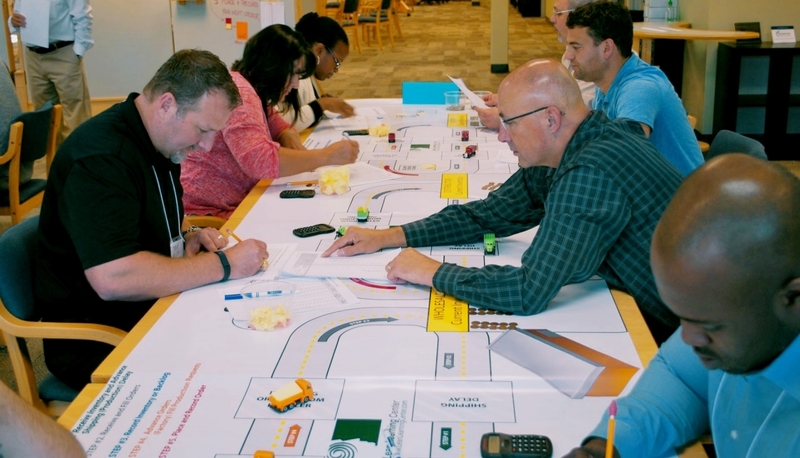 The principles and rules explored in detail during The Lean Experience®® have proven to be universally valuable in the world of businesses with a desire to improve. Benefits of The Lean Experience®® include how to produce products with higher quality, increase profits, improve customer service, reduce waste, improve employee engagement and satisfaction, and more.